Dr Krippling Cannabis Seeds | Online - Cannabis Seeds | Buy the best cannabis seeds online! Marijuana has been on this planet earth long before mankind inhabited it. Team Krippling are merely doing what we have been wired / designed by nature to do. With help from the elements, and through evolution, Mother Earth created plants aeons before bothering with us. As with all animal populations on earth, we are here to survive and procreate, but we all have a subliminal analogous purpose to transport, disperse and preserve seeds and plants to ensure genetic survival for the future. All plants are miracles, especially cannabis, and there are many overlooked and suppressed benefits to be unearthed / realised in the near future. 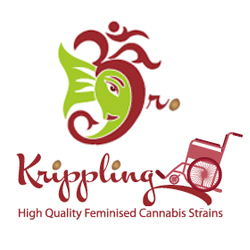 Team Krippling are blissful servants to this plant with breeding/proofing stations in a few countries throughout Europe*, working on hundreds of different strains from all over the world. Many of Team Krippling's breeders have techniques and knowledge from generations of farming, and as much as we share genetics, techniques and co-operate with other seedbanks and breeders, we are committed to seeking our own champion "Hercules" ganja mother and father strains, by popping hundreds of pips weekly, if not every other day, from select original breeders / seedbanks, as well as being on the lookout for a super performer from brand new strains and seedbanks. The main genetic make up of each strain is provided, although some of the genetics, which give our strains the stability and Krippling effects we were after, will remain secret with us.